Waterstones is pleased to support the charitable efforts of 24 Stories, buying the book at full retail price. On the night of 14 June 2017, a fire engulfed the 24-storey Grenfell Tower in west London, killing at least 72 people and injuring many more. An entire community was destroyed. For many people affected by this tragedy, the psychological scars may never heal. Post-Traumatic Stress Disorder is a condition that affects many people who have endured traumatic events, leaving them unable to move on from life-changing tragedies. In the immediate aftermath of the fire, the focus was rightly placed on providing food, shelter and health care for those left homeless - but it is important that we don't lose sight of the psychological impact this fire will have had on its survivors. 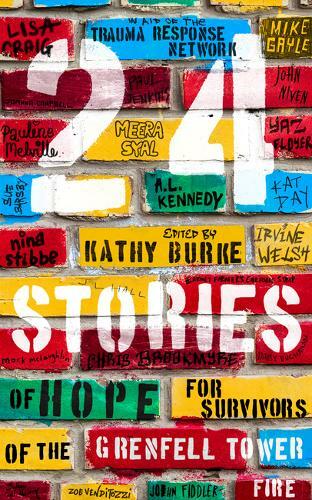 24 Stories is an anthology of short stories, written on themes of community and hope, by a mix of the UK's best established writers and previously unpublished authors, whose pieces were chosen by Kathy Burke from over 250 entries. This mix of contributors includes Irvine Welsh, A. L. Kennedy, Meera Syal, John Niven, Pauline Melville, Daisy Buchanan, Christopher Brookmyre, Zoe Venditozzi, Nina Stibbe, Mike Gayle, Murray Lachlan Young and Barney Farmer. Profits from the book will be passed from its publisher to Trauma Response Network, a not-for-profit first aid service that supports those with Post Traumatic Stress Disorder. In support of this effort, Waterstones will waive the discounts we usually seek from publishers and will be supplying the book with no profit for ourselves.